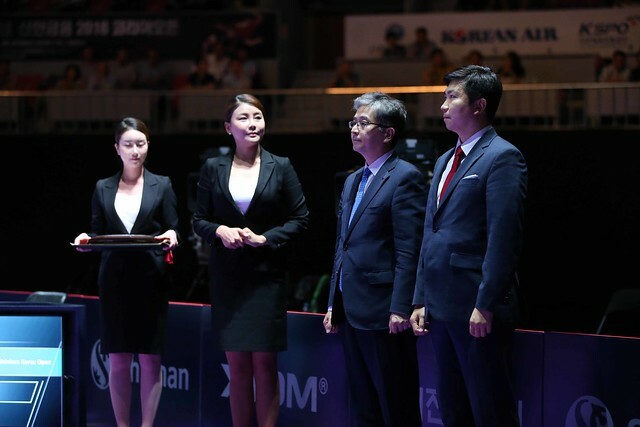 Following two days of qualification and then the opening day of action on Thursday 19th July at the Seamaster 2018 ITTF World Tour Platinum Shinhan Korea Open in Daejeon; there has been a host of exciting entertaining and enthralling contests. The fact that a delegation travelled south from DPR Korea has made the event a most special occasion. “Non-stop, captivating matches entertaining the spectators, it’s not difficult to hear crowds chanting “We are one” throughout the stadium. I have never seen such a large group of people rushing to the stadium to watch the Korea Open table tennis event. However, this year, it is clear that they are very excited and happy to enjoy this great festival. This year, the status of the Korea Open was upgraded to a “Platinum” event. Consequently, the most capable ITTF experts have gathered to work for the Korea Open. Zena Sim, a young Competition Manager, is working extremely professionally; the co-ordination and co-operation between her and the Referee Team is most exceptional. Numerous umpires, with an ideal combination of seasoned experience and dynamic energy are always on alert, guiding the event smoothly forward. The organising committee and the host city are also giving their best for the Korea Open. We believe that the great success is derived from our attention to small details. Everyone that is involved with the event understands what they have to do and how to co-operate with others. This is a “the PERFECT partnership”.